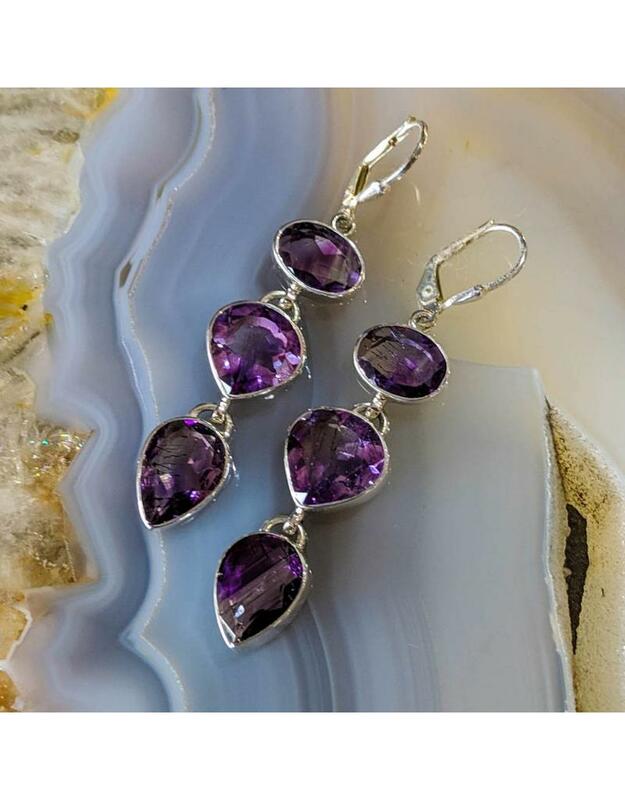 The amethyst stones in these sterling silver earrings were carefully chosen because the stones exhibit color zoning and hematite inclusions. Color zoning refers to uneven distribution of color within the gemstone. Uneven color distribution is traditionally considered less desirable, but we're not traditional. Being Science enthusiasts, we love getting hints at how the crystals were formed. Heat and pressure work together to generate imperfections in the crystal structure, which we see as color. The presence of color zoning tells us the temperature was not uniform during crystal formation. Hematite inclusions come in a variety of forms, but these earrings have red needle like marks inside the crystal. Hematite is iron oxide, and amethyst is colored by iron impurities, so red hematite inclusions may be no surprise. But, these inclusions are created as the crystal forms, and indicate the direction of crystal formation. So, we think these "undesirable" traits are awesome. 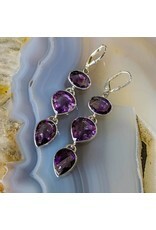 The amethyst is set in sterling silver. The earrings measure 57x11mm.